Contributor Gabrielle is a Social Worker (LMSW) at Barrier Free Living’s Secret Garden Non-Residential Domestic Violence Program. Gabrielle began her work at Secret Garden as a social work intern in 2014. After graduating with her Master’s Degree she joined the team. Gabrielle is currently enrolled in the Trauma Studies Program at the Institute for Contemporary Psychotherapy and will soon be certified in the specialized therapy approach outlined in the article below. It can be difficult to find a good therapist in New York City. Even if you’re lucky enough to find someone you work well with, there may also be the added barrier of cost; especially if you need or desire a specialized therapy. One type of specialized therapy that can be used for trauma survivors (like survivors of domestic violence or sexual assault) is Eye Movement Desensitization and Reprocessing (EMDR). EMDR is an effective and evidence based therapy. Barrier Free living’s Secret Garden program has two members who are certified in this therapy. While EMDR can cost anywhere from $150 to $200 a session in out of pocket expenses (if insurance doesn’t cover the therapy or if someone is not insured) Secret Garden is able to offer this service for no cost. Any survivor of domestic violence who has a disability (a documented or undocumented disability) is eligible for services at Secret Garden. Prospective clients please call our hotline: (212) 533-4358 to schedule an intake session. 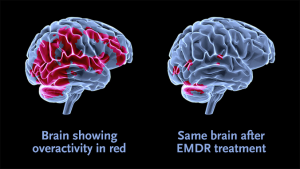 See how EMDR works by watching this video.